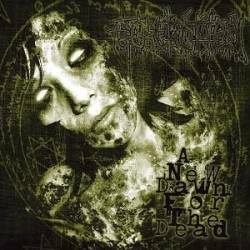 Gorerotted, the splatter kings from the United Kingdom, are back with their third album entitled A New Dawn For The Dead. Compared to their last CD Only Tools And Corpses, the cover looks less gory and more like metal artwork. And there have been musical changes too. Their previous album was godlike grind, so repeating that feat would maybe seem nice, but not too exciting. The opener And Everything Went Black is still quite simple and primitive grind core in the vein of Gorerotted's earlier CD. Again the change of screamed metal shouts and grind grunts is done in a very professional way. But I will miss the punk vocals because the third singer has left the band and Gorerotted thought that two singers would be enough. Apart from the opener, there are two more songs reminding me of their glorious past, but the new metal way Gorerotted have chosen is also very rewarding. Nervous Gibbering Wreck starts like Slayer's Raining Blood, being one of the weirdest tracks on the album. But especially in the middle of the album, you find four songs which sound very progressive. In the Eighties we used to call this kind of music techno trash because it was thrash metal played on a very high technical level. You could describe Gorerotted's new style as a mixture of Napalm Death and Living Death. On the final track Parts For Resurrection, Gorerotted display a fine example of brutal rock'n'roll. Gorerotted have succeeded to break with their musical past, to go into a different musical direction and furthermore they haven't lost any credibility. Huge respect from my part!